Save Time and Money by using the Pink Palace Express Bus, the quickest way to travel between Corfu and Athens and make your holidays easier! Travelling overnight and arriving in the morning on your destination saves you a night’s accommodation. 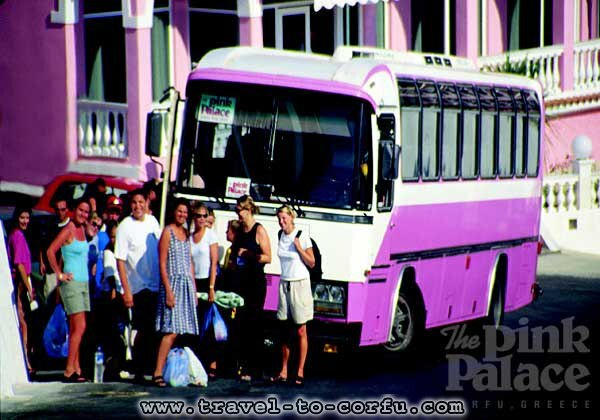 The trip from Corfu to Athens:The bus from the Pink Palace leaves every other day at 9 p.m.You can make a reservation for that when you arrive at the Pink Palace. The price is 38 euro and that includes: The bus ticket, breakfast and dinner, free luggage storage and use of our facilities the day of your departure and the ferry tickets for the boats between Corfu and Mainland. The Trip from Athens to Corfu: The bus leaves from the hostel Aphrodite at 8 p.m. every other day. You can make a reservation by phone one day in advance. The price is 47 euro per person and that includes: The first night accommodation at the Pink Palace in B' class rooms, breakfast and dinner the day of your arrival and the ferry tickets for the boats between Mainland and Corfu.